The ferry Moby Zaza caught fire at the passenger terminal in Nice, France. The fire erupted into the engine room after short circuit of the diesel generator and vessel’s funnel was clouded of thick smoke. The crew reacted immediately and succeeded to extinguish the flames without need of the help from local firefighters. During firefighting one crew member was slightly injured and was medical treated in the near hospital. All the passengers were evacuated successfully without injuries. 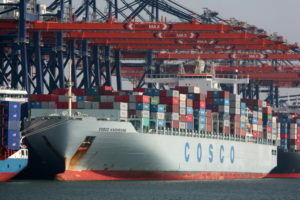 The incident was reported to the port authorities and investigation for the root cause is under way. 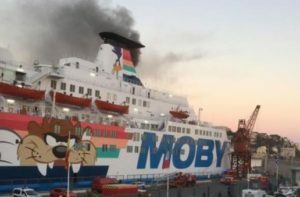 The fire on board of the ferry Moby Zaza caused panic among the passengers. The vessel arrived at the terminal after a voyage Bastia, Corsica and fire erupted when all the people were still on board. The crew evacuated all the passengers on board following the emergency evacuation plan, but some of them were in panic and jumped overboard on the terminal. Fortunately there were no reported injuries. The ferry was detained at the port for further inspection and special survey. The next planned voyage to Bastia was cancelled. The ferry Moby Zaza (IMO: 8020642) has overall length of 136.00 m, moulded beam of 24.00 m and maximum summer draft of 6.00 m. The deadweight of the vessel is 2,880 DWT and the gross tonnage is 22,161 GRT. The ferry was built in 1982 by SSW Schichau Seebeck shipyard in Bremerhaven, Germany. The owner and operator of the vessel is Italian ferry operator Moby Lines.